These bead supply sources are my personal favourites. Just about every bead and finding I have in my stash (other than straight from the bead artist) has come from one of these places. All but one allow you to order online and they ship right to your door! I have to admit to being a bit of an online ordering junkie. I can pick out what I want from home, I don't have to find parking, and I get stuff delivered right to my house. I love having beads delivered to my house. It's like getting gifts in the mail. Best of all, I usually get beads and findings cheaper than I would at a physical retail store too. I truly believe that the internet is the great leveller. Competition is all around so companies know they have to deliver on price and service or be stomped. Which is win-win for all of us consumers right? 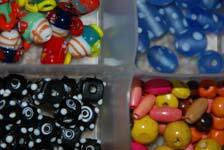 So here is my short list of favorite bead supply sources. Did I mention these are my personal suppliers? Arton Beads, 523 Queen Street West, Toronto, Ontario, Canada My favourite bead supply sources for when I have to pick up a few things last minute for an order or if I want some inexpensive beads for kid projects. Of course the above suppliers aren't the only place to shop! You can find a large variety of resin jewelry making supplies in the How to Make Jewelry Supply shop with more to come in the future. I've bought sterling silver sheet and wire from Imperial Smelting (Canadian Smelter) and have been very happy with their service. Annealing costs extra though ($5 per separate size) You have to buy in quantity in order to save any money. If you just need a little, sterling silver wire and sheet will cost more per ounce. Copper wire is a much less expensive alternative and you can even get silver colored, gold colored, and a rainbow of other colored wires.